Here’s the British Museum’s description of this print: “Two young women dressed in fine clothes in a room with decorated wallpaper, one sitting in front of the window looking onto the street, with a pet squirrel on her lap, turning to smile towards the viewer and pointing at herself, while the other stands behind her chair on the right. 12 May 1794.” It’s good to get the pet squirrel question out of the way. This is another print that’s hard for us to read completely: you might wonder why they’re called the Frail sisters. Is Frail a proper noun, an adjective, or something else? It’s probably code: frail here may well refer to the strength of their morals rather than their biceps. There’s another Frail Sisters drawing, also 18th century, probably late 1780s-early 1790s. This is appears to be a ‘straight’ drawing, but I don’t know: it could be an artist’s portrait of three prostitutes at play. Or it could be actresses (they weren’t so very far from prostitutes and courtesans). Mrs Frail appears in William Congreve’s Love for Love; do these images also reference characters first seen in Restoration comedies? This is stuff I haven’t thought about in a long time, so I can’t yet unpack how the title and meaning of the print relate to what the women are wearing. And I might be over-thinking things a bit, so let’s step back and just look. What is the standing sister wearing? A half-robe, indoors. Time of day, indeterminate, but perhaps morning. A somewhat easier image to read is the print after George Morland’s The Farmer’s Door, from 1790. 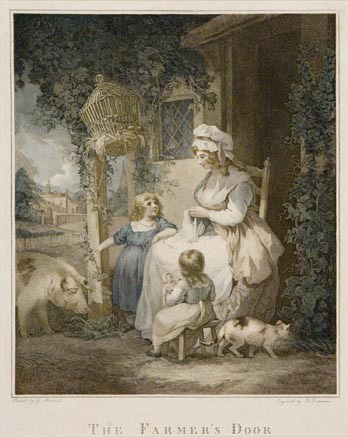 This genre painting presents the romanticized vision of humble life, with the farmer’s wife and her children (note the blue stays on the seated child). Is the farmer’s wife wearing a half-robe over a quilted petticoat and apron? The quality of the images I can find is poor, and the coloring questionable. In another version here, the kerchief is clearer and seems to go over a long-sleeved garment with a short skirt. In Selling Carrots, there is another short-skirted garment with long sleeves worn over a petticoat and with a kerchief. Without getting overly distracted by titles and meaning, I think there are clues to how these half-robes or jackets are worn by women of different classes, aspirations, and locations. For rural women who are not gentry, these appear to be comfortable working clothes worn all day. For urban women, they seem to be worn early in the day, and sometimes out of doors, perhaps even to the lending library.